The ultimate Hindu pilgrimage tour to holy lake mansarovar and Kailash parbat- the abode of Lord Shiva . The Tirth Yatra to Kailash Parbat and holy lake Mansarovar is the holiest of all the pilgrimage for the Hindus. Visiting the abode of Lord Shiva once in a lifetime is a dream of many. 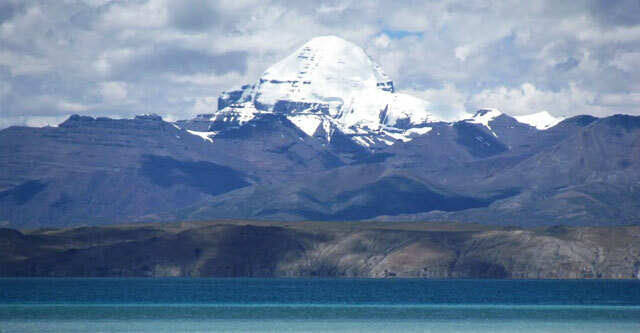 Kailash lies on the remote corner of western Tibet . It is reachable after four days of drive from Nepal’s capital Kathmadu on Jeep. Besides the religious point of view, this region is extremely beautiful and both spiritually and culturally enriching . There are two itineraries of kailash yatra , the first one with Jeep drive form Kathmandu to Mansarovar and the second one is by helicopter upto Tibet boarder from Nepal. We receive and transfer you from Kathmandu airport to hotel. Rest . Day 2: Kathmandu – Visit temples. Pashupatinath Darshan and guided tour of Kathmandu. Briefing about the tour. Day 3: Kathmandu – Nyalam 3750 m (150 kms). Drive from Kathmandu to Nepal Tibet boarder , complete immigration formalities , meet our guide and driver from Lhasa and drive to Nyalam. Day 4: Nyalam – Day free for acclimatization. Driving from 1350 m at Kathmandu to 3750 m at Nyalam, we gain considerable height. We acclimatize in Nyalam to avoid altitude sickness . Cross the high Labung la pass (5050m- 16565 ft) enjoy the feeling of being atop a 5000m+ Himalayan pass, enjoy spectacular mountain views form the pass. Drive past the big Peiku Tso lake & cross Brahmaputra river ( Yarlung Tsangpa in Tibetan ) to reach to Saga . small town of Zhongba before reaching to Paryang. 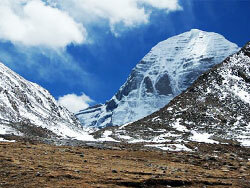 At paryang you will feel the excitement of reaching Manasarovar the next day . o/n in a guesthouse . Day 7: Paryang - Mansarovar 4558 m (277 kms). Morning pooja and hawan on the bank of Mansarovar. Afternoon drive to Darchen to start the Kailash Parikrama next day. Day 9: Darchen – Tarboche – Dirapuk (4860 m). The hardest and most important day of the yatra . Cross high Dolma-la pass (56700 m) and descend to Gauri kund and further trek along with the river to Diraphuk, dinner & overnight at Camp . After a trek of about 6 kms, and we will be reaching to the point where the jeeps will be waiting for us - drive to Darchen , after lunch we drive to Lake Mansarovar (horchu side) 70 kms , overnight at Camp "
We are returning home - leaving this holy place. Day 13: Paryang to Nyalam. After breakfast drive to Nyalam - light lunch on the way - dinner and overnight at lodge. Day 14: Drive to Nyalam – Kathmandu. Write to us with number of persons on your group, category of hotel you would like to stay in Kathmandu and other requirements. Half day Sightseeing tour in Kathmandu with English speaking guide. Transfers from Kathmandu to Kodari border and back in Non AC buses. 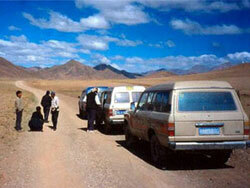 All surface transport in Tibet by Japanese landcruisers 4500 CC with supporting truck. Freshly cooked 3 vegetarian meals a day by our experienced cooks. All Camping equipments (tent, mattress, dinning tent, kitchen tent, kitchen utensils, tables, chairs, toilet tent , sleeping bag etc ). Duffle bag ( big bag for keeping personal clothes and equipments). Accommodation as per itinerary in clean comfortable guesthouses through out the trip. Horses/ ponies if used for riding during Kailash Parikrama, early request to our guide is necessary and the cost ( roughly USD 50 per day ) will be borne by guest on the spot. Any expenses of personal nature such as travel insurance, drinks, laundry, telephone / fax calls, porters or arranging additional transportation. Services other than specified above . If You wish to do the kailash pilgrimage in a more easier way , helicopter tour would be the ideal option, though it is more costly than the tour by Jeep. Day 02: Kathmandu – Fly to Nepalgunj. Morning Pashupatinath darshan and afternoon fly to Nepal Gunj 1hr flight.O/n in Hotel. Day 03: Fly Nepalgunj – Simikot (2870 m ) – Hilsa – Taklakote (3900m ). Day 05: Drive Taklakot to Mansarovar (4560 m) 90 km / 1.5 hrs Drive. Early in the morning drive to Mansarovar -Religious pooja – hawan etc. and continue drive to Darchen. Overnight stay at Darchen guesthouse . Day 06: Darchen – Tarboche & Trek to Dirapuk ( 4860 m ). First day of kailash Parikrama. Day 07: Trek to Zuthulphuk ( 4760 M) 18 km / 9- 10 hrs. Day 08: Zuthulphuk – Darchen – Mansarovar Parikrama. Third and last day of Kailash parikrama. Day 09: Drive to Hilsa and fly to Simmikot . Day 10: Fly Nepalgunj - Kathmandu & departure to onward destination. Price : contact us wih number of people, your requirements and hotel category in Kathmandu for the quotation.